Society is constituted by language and language is constituted by society. It is through language that our existence is communicated and confirmed. Yook Woo Dang is perhaps second of the two most well-known gay poets of South Korea, the other being Gi Hyeong Do. Unlike Gi Hyeong Do, whose poetry mostly revolved around love, Yook Woo Dang’ s poetry seems to be all-encompassing. He speaks about love but also about the repressive structures society produces through the institutions of family, schools, law, etc., which completely alienates an individual while simultaneously cultivating a behaviour of submission in them. Woo Dang spoke out against all such regimented structures which sought to take away individual freedom. Of the many he spoke against there is the infamous mandatory military service in South Korea—which is glorified in South Korean popular culture—the corporal punishment, treatment of juveniles and homophobia. Woo Dang addresses homophobia extensively in his poems because a gay or lesbian person is doubly oppressed by society. As a result of his outspoken views, he was ostracised in school and thrown out from his house when he came out to his parents. Hyun Seok ended his life in 2003 in a protest against the discrimination against homosexuals in South Korea. He was only 18 then. Society is constituted by language and language is constituted by society. It is through language that our existence is communicated and confirmed. It is through language that existence is confirmed or denied. “[N]aming confers existence,” writes Don Kulick in his essay Gay and Lesbian Language and one must ask—who is doing the naming and who really requires these names. For though Juliet might have sought something beyond the name of Romeo—it is the name which acts as a starting point. If the name did not exist, then neither did the search for the being behind the name. Alcohol, cigarettes, sleeping pills, foundation, green tea and the rosary—these six things are my precious friends. That is why it’s ‘Yook Woo Dang’ (?? ?/Home of Six Friends). 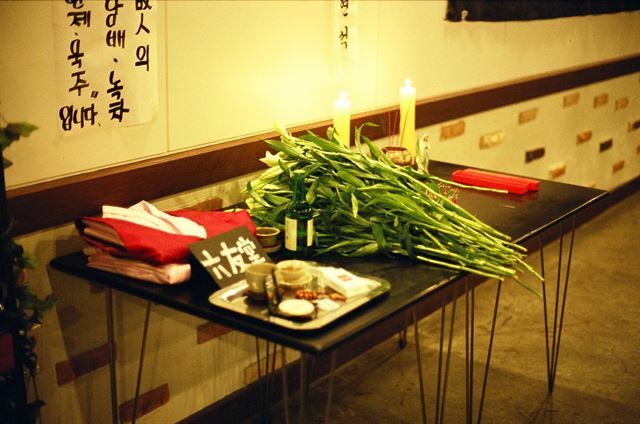 The first death anniversary of Yook Woo Dang celebrated with the six things he mentions in his suicide note. Woo Dang’s chosen pseudonym becomes a way for him to reconstruct his identity by constituting it in and through material objects that held meaning for him (who exists materially, in the physical body, and the soul, the metaphysical). In fact, this was not the only name he was known by. Dang Wook was also known by other names such as Seolheon (Snow House), Donghwa (Flower Boy) and Midong (Beautiful Boy) refuseing to belong to one name. He existed in multiplicity. When the law, as Butler points out in her book Gender Trouble, refuses to acknowledge, therefore legitimise and produce the ‘homosexual’ as a subject; does not name, then Woo Dang renames himself—constitutes himself—as a subject of the state who must be named and acknowledged. Although Butler makes an entirely different point, where she points out the problematic nature of being constituted as a ‘subject’ and legitimacy attached via and because of it—it is important to realize that one can revoke their ‘subject’ status only after being conferred it. The bigger revolution for being recognized as human must occur after realizing smaller revolutions of being recognised as ‘woman’, ‘gay’, ‘lesbian’ etc. For despite all of the problems ‘labels’ cause, they are also a starting point of identifying oneself. They become a point of departure for shrugging off the same labels and moving into a label-less space. But for now, we need them. Woo Dang needed them. Thus, gay needed to be a ‘subject’ of the state in order to qualify for basic equality. And that’s what Woo Dang’s death led to. It was his death that prompted the word, the name ‘dong-song-ae’—homosexual—to be removed from the list of web content considered harmful to minors. Despite many gay rights activists demanding a change in the laws, it was not until after 2003—after Hyun Seok’s death—that protection laws for juveniles were enacted. His death gave a new lease to the word ‘homosexual’ in South Korea. On the tenth anniversary of his death, close to 200 people gathered to remember not only Woo Dang but also other LGBTQ persons who either ended their lives because of homophobia, or succumbed to chronic diseases like AIDS. Catholic News reports the Executive Director of Solidarity for LGBT Human Rights of Korea as saying, “Only here we remember you and call your name”, after which he proceeded to read out the names of each and every person who fell victim to homophobia. Naming becomes a means of remembering, of memorialising. Woo Dang’s death thus becomes a platform not only to remember him but everyone who has faced discrimination and suffered because of homophobia. The social stigma surrounding homosexuality in South Korea is still so prevalent that coming out of the closet would mean facing abuse from every front. Juveniles especially face the risk of being thrown out of their house. Woo Dang’s case was no different. After a fall out with his family over his sexuality, Hyun Seok was forced to spend his nights at places where he worked part-time or at Dong-illyeon (Korean acronym for Solidarity for LGBT Human Rights of Korea), the human rights group’s office where he worked. Dong-illyeon was also the place where Dang Wook killed himself in 2003. Of a thousand step journey’s precipice. That unlucky youth Oh Se In, that wandering soul. This homelessness also surfaces in Dang Wook’s poetry where we visit Itaewon’s bustling streets (‘Itaewon Nights’), in his love serenades where one reunites with their love only in another life (‘Rebirth’), in poems pouring over alcohol in bars (‘At a Gay Bar’, ‘Queer Get-together’), but perhaps most in ‘A Gay Life’ where Dang Wook presents the poem in the form of a dialogue, discussing the condition of a man forced out of his family because of being gay. In his poem ‘Sorrow’ he claims, queers are “untouchables” of Korea. His poem ‘Complaint’, where gays are “eyesores” who have been forced to live in secret—“in nooks and crannies”. As a result of this, youngsters who would come out to their family would face excommunication from the community. But despite everything, Hyun Seok’s poetry envisions a hopeful future. In poems like ‘Rebirth’ and ‘Quarter’ we see a yearning for happiness which could be fulfilled if—if one really listens to the “whispers”, if one can see truly realise the potential of the “quarter”—of ourselves. The poems are prophetic and almost at the cusp of dream and reality—they have the promise of realisation but also seem to suggest their capricious nature. The moment needs to be grasped, he seems to be saying, the revolution must not be too late. P.S. I wonder how the future generations would think of me. A man of many names, perhaps, it is best to remember him in his multiplicity, in his plurality. He must exist not in one, but in many. In his refusal to bow down even to language, we must celebrate him in his multiplicity. Sunflower is a student of literature and enjoys dabbling in different areas of research. Translation and poetry are especially interesting to them. Are You Ready For A Straight Proposal? Previous post Can Liberal Education Exclude LGBTQs?